There are various stories associated with the origin of the pretzel. One of the most frequently related accounts is that they came into being in A.D. 610 when Italian monks made them and gave them to their young students as a reward for learning their prayers. The stories also vary concerning the symbolism of the unique shape of the pretzel. In connection with the story about the monks giving pretzels as rewards, the shape is believed to symbolize the crossing of the arms, which was their traditional posture for prayer. Some believe that the three holes in the pretzel design represent the Holy Trinity, which is the Father, the Son and the Holy Spirit. Some stories indicate that the pretzel was invented by European monks. Some say that pretzels originated in southern France. One story regarding the pretzel shape claims that the loop design is similar to the communion bread used in monasteries. On a more practical level, some say that the pretzel was made with loops so that bakers could hang them on sticks. A painting by Job Berckheyde dating back to 1681 supports the practicality of the loop design. While no one may know for sure why there are loops in the pretzel design, that unique shape has made the pretzel useful in many ways. In Austria, pretzels are hung on Christmas trees. In Germany, children used to hang pretzels around their neck on New Year’s Day. This tradition is likely connected to the belief that pretzels are a symbol of good fortune. The simplicity of ingredients in pretzels, flour and water, meant that they could be eaten during Lent. Pretzels became associated with fasting and prayer. Pretzels were at one time hidden on Easter morning just as eggs are hidden on Easter today. The texture of pretzels was soft until 1861 when Julius Sturgis began making hard pretzels in the first commercial pretzel bakery. The factory was located in Lititz, Pennsylvania. The hard pretzel had a longer shelf life than the soft pretzel. It also had the durability to be sold in locations that were a greater distance away. This led to an increase in the availability and popularity of the pretzel. In 1935, the first automated pretzel maker was introduced by the Reading Pretzel Machinery Company. That invention greatly increased the productivity of pretzels. Today, more than $500 million worth of pretzels are sold each year in the United States. Of those pretzels sold, 80% are made in Pennsylvania where the hard pretzel originated. While pretzels in their original form remain a popular snack choice, coated pretzels have also become a desirable snack and party food. Covered pretzels include coatings such as chocolate, yogurt and peanut butter. Pretzels are a good snack option for people who are watching their calories. They have 130 to 160 fewer calories per 100-gram serving than potato chips or tortilla chips. They also have a much lower fat content than either of these chips. Pretzels are a cholesterol-free food. If you buy bulk pretzels and add them to your trail mix or make them a consistent part of your snack routine, you can increase your fiber intake. A one cup serving of pretzels provides 6% of your daily fiber requirement. Sometimes, it’s difficult to get all of the vitamins and minerals you need each day. Choosing a snack such as pretzels or covered pretzels can be a good way to increase your intake of various vitamins and minerals. The nutritional value of pretzels is derived from the enriched flour, which is their key ingredient. In a serving of pretzels, you can acquire 20% to 40% of the daily requirement of riboflavin, niacin and thiamin. Folate helps build red blood cells. By enjoying a serving of pretzels for a snack, you can get 71% of your daily requirement of folate. You may want to buy wholesale pretzels as a budget-friendly way to include them in your diet. They’re a good source of iron and zinc. In addition to that, they’re a source of any other minerals that your body needs. Hard pretzels are a tasty snack in their original form. However, coated pretzels have become a very popular snack choice. They also appear frequently on party tables, in trail mixes and in snack mixes that are prepared for personal use or as gifts for various occasions. Chocolate covered pretzels can satisfy a mix of snack time cravings. They are crispy, sweet and salty. It’s recommended that dark chocolate be included in a health-conscious diet. 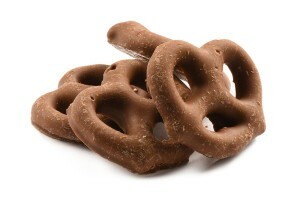 Dark chocolate coated pretzels are a luxurious, nutritionally beneficial snack. Covered pretzels are appealing to kids and adults. Pretzels with a peanut butter covering are a fun treat for kids You might even want to use pretzels as a reward, just like they were originally used. They could be given to children as a reward for completing chores or accomplishing small goals. Covered pretzels make an attractive party table food. Yogurt covered pretzels are decoratively diverse. They can be used in an elegant party setting or mingled into the decorations on a festive, colorful holiday table. A gift tin filled with covered pretzels would be a fantastic gift for any occasion. Keeping a supply of various types of pretzels on hand can help you avoid the temptation to indulge in a less healthy, higher calorie snack.